It seems like I am always up in the air, but this week I decided to do something a bit different. 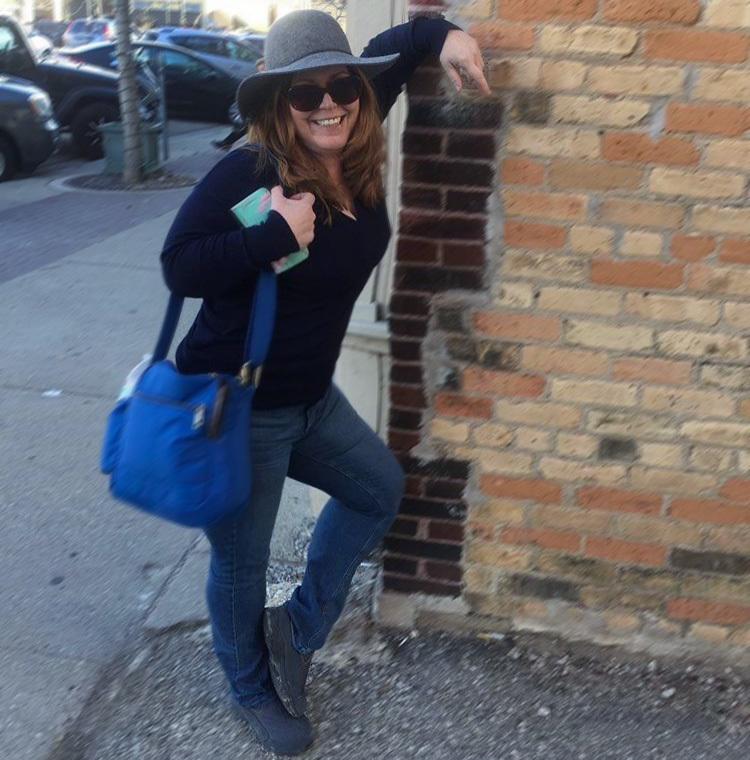 I hit the road with my friend Lisa for a Midwest adventure from Indianapolis to Cedar Falls to Chicago, where we ended it all at quite a party. Day one began with a two hours drive to Indy, where we found pouring rain. The plan was to take a Segway tour through White River State Park – weather permitting. 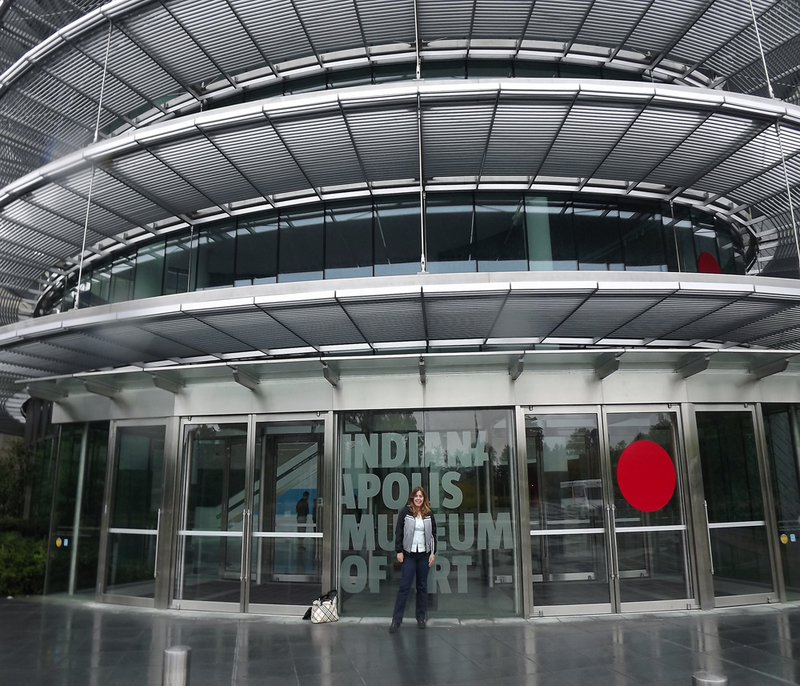 We were disappointed, but Morgan Greenlee from the Indianapolis Visitors Bureau quickly adapted the afternoon plans. 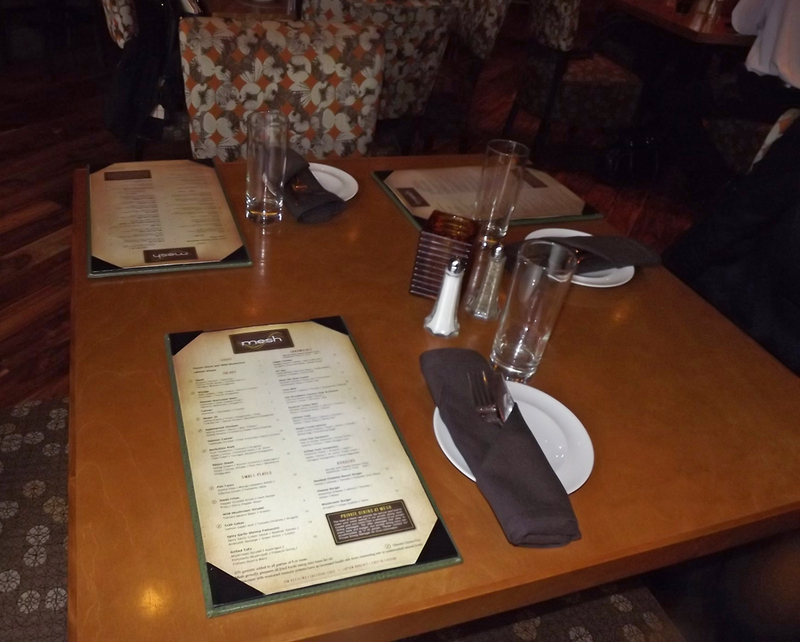 After we checked into our rooms on the penthouse floor of the Omni Severin, we were off to lunch at a new restaurant in town. Mesh on Mass Avenue. I enjoyed the Short Rib Slow Cooker (without the bun) with a glass of Noel Bossier Vouvray, a semi-sweet French white that was very fruity, and Lisa had a Salmon Caesar salad. 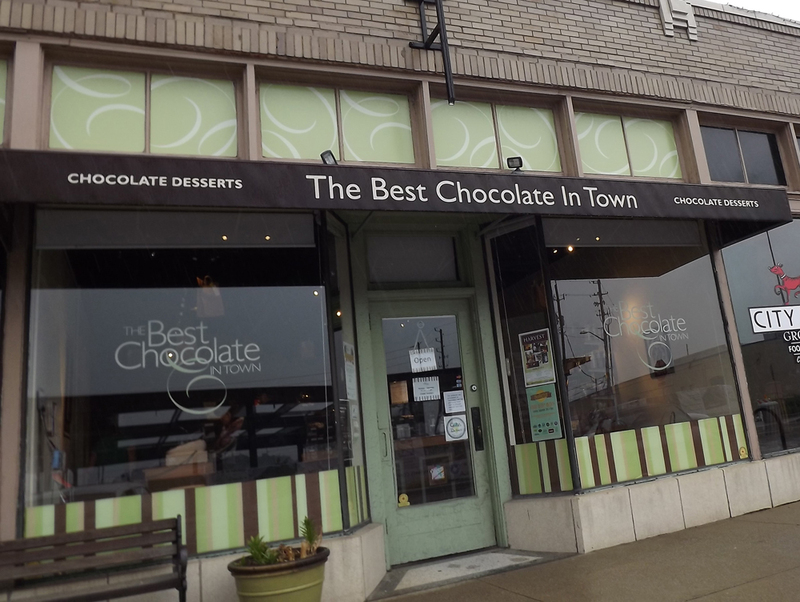 Both the restaurant and the menu had a modern feel, which is exactly where all of Indianapolis is heading these days. The city is preparing to host the 2012 Super Bowl in a big way. They do not want visitors feel like there's nothing to do before and after football. 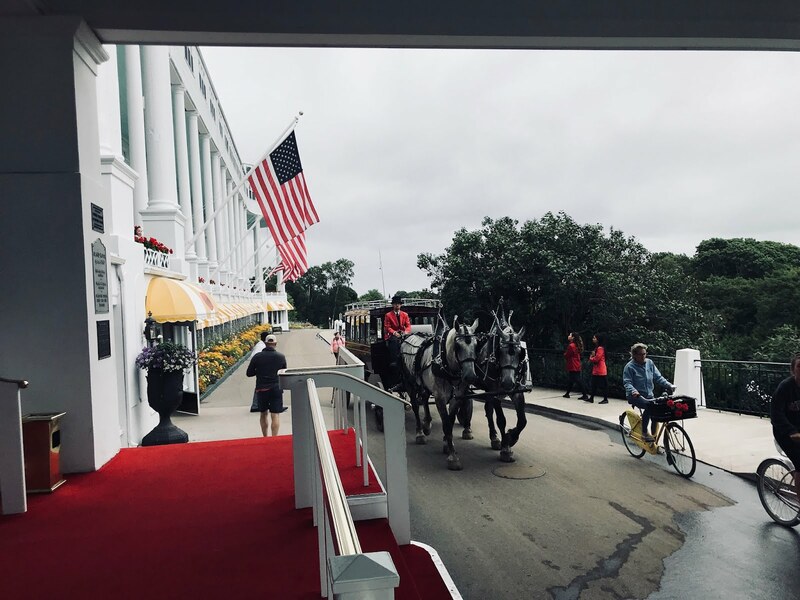 They are instead spending billions getting ready to have them stick around with new eateries, hotels, shopping, pedestrian streets for musical events, and even updated roads and bike paths. We went straight from lunch to the Indianapolis Art Museum. 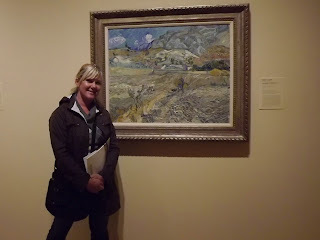 I had never been there before and was excited to see it, especially since they had opened up the museum just for us on its day off! 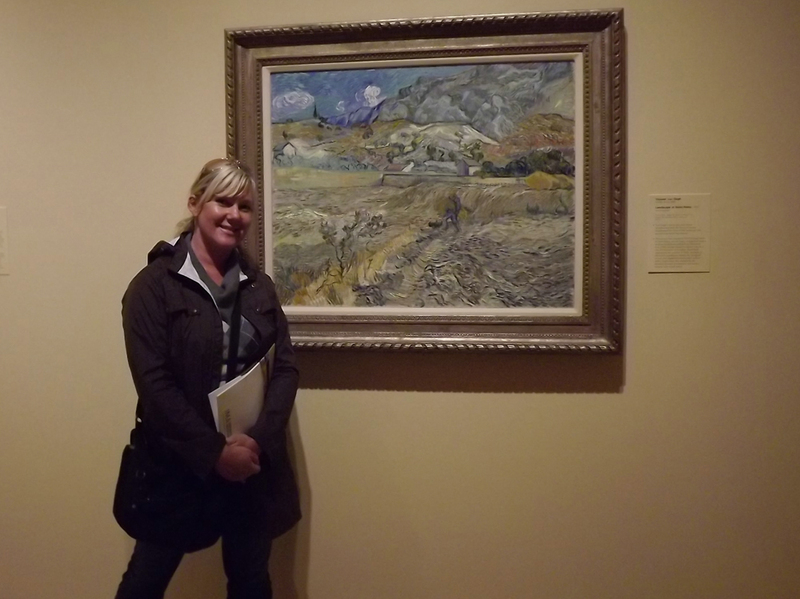 We were escorted around for a few hours of art gazing from Van Gogh to Picasso, Norman Rockwell to Georgia O’Keefe. 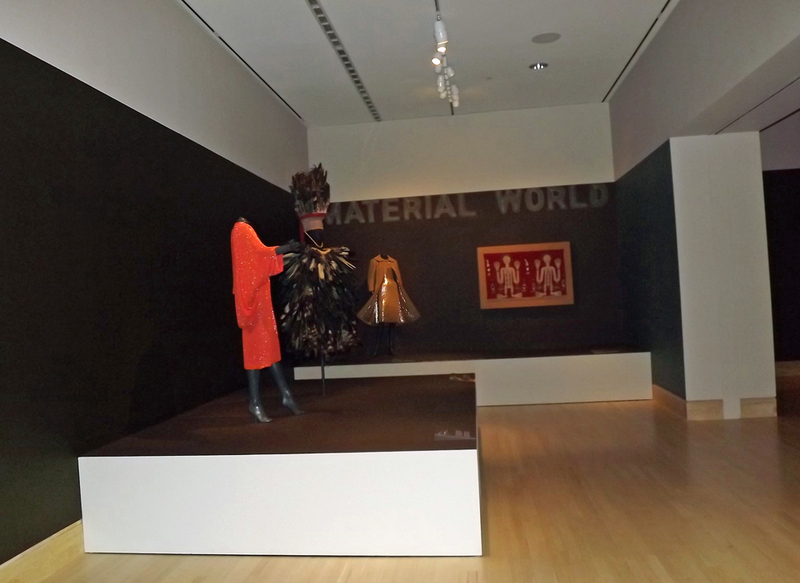 We also got to see the “Material World” exhibition, which demonstrates some beautiful (and some strange) clothing from well-known and unknown designers. The museum does not have an entry charge (a few of the exhibits do have charges) and I would definitely recommend checking it out. 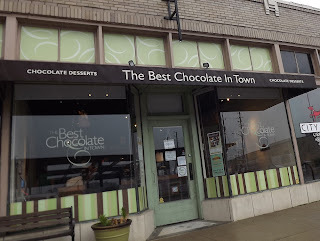 After the museum, we went for a little snack at The Best Chocolate in Town, where the truffles are as unusual as they are delicious. We took a few unusual samples -- including Rosemary, Dark Chocolate Cheesecake and Cinnamon Basil – to go before heading across town to the new Kurt Vonnegut Memorial Library. 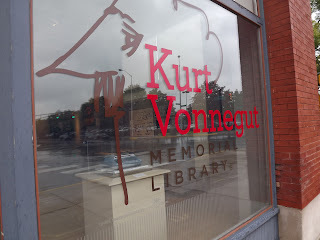 Vonnegut was one of my favorite authors back in college and the visit brought back a lot of memories. The library showcases many of his famous works (such as Slaughterhouse Five), and tells the story of this complex man. We had a short while to go back to the Omni Severin Hotel and get ready for dinner. 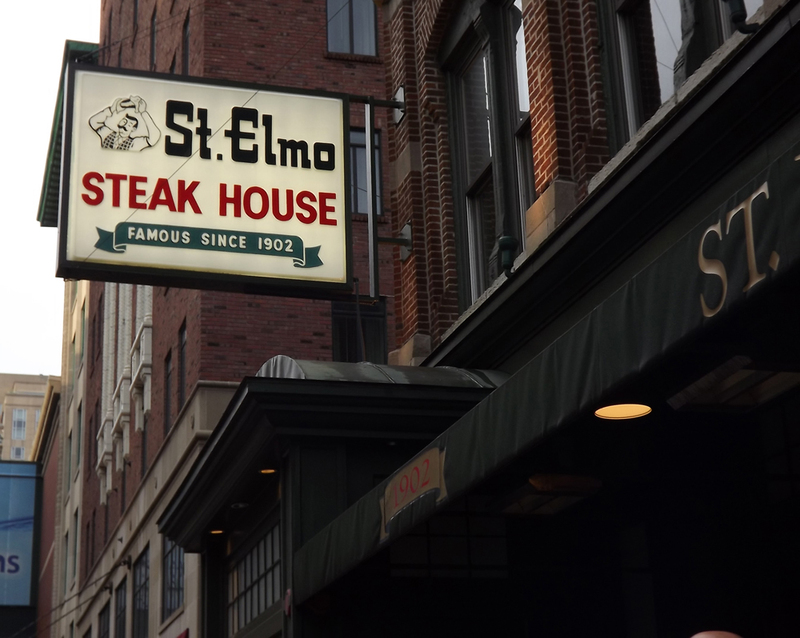 Morgan came with us down to one of the oldest and most famous restaurants in Indianapolis, St. Elmo’s. There we met Chris Ratay, who took us to the restaurant’s newly built upstairs lounge. It’s quite a place, with a beautiful bar, relaxing couches and even a communal table for singles or large groups. The lounge has an exciting cocktail menu and some food items. We decided to each order a different drink so we could experience four of their most popular – French 75, Elmo Cola, Ginger Beer and the Spicy Agave Margarita. 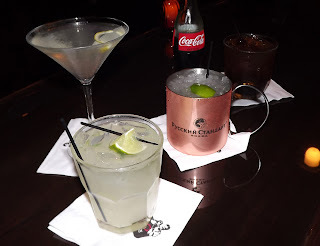 We liked them all, but I was happy with my choice, French 75, which was made with Wisconsin Death’s Door Gin, St. Germain and hand-squeezed lemon juice, before it’s topped with a splash of champagne. Morgan had the signature drink, Maker’s Mark Bourbon which has been infused with Italian Maraschino Cherries and Madagascar Cherries, then mixed with Coke (diet or regular). Chris drank the Ginger Beer in a copper cup and Lisa prepared for her appetizer with a jalapeño filled margarita. The appetizer in question is billed as the “World Famous Sinus-Clearing Shrimp Cocktail.” Since I have a seafood allergy I had to rely on my friends for this one and I’m told the description is an accurate one. 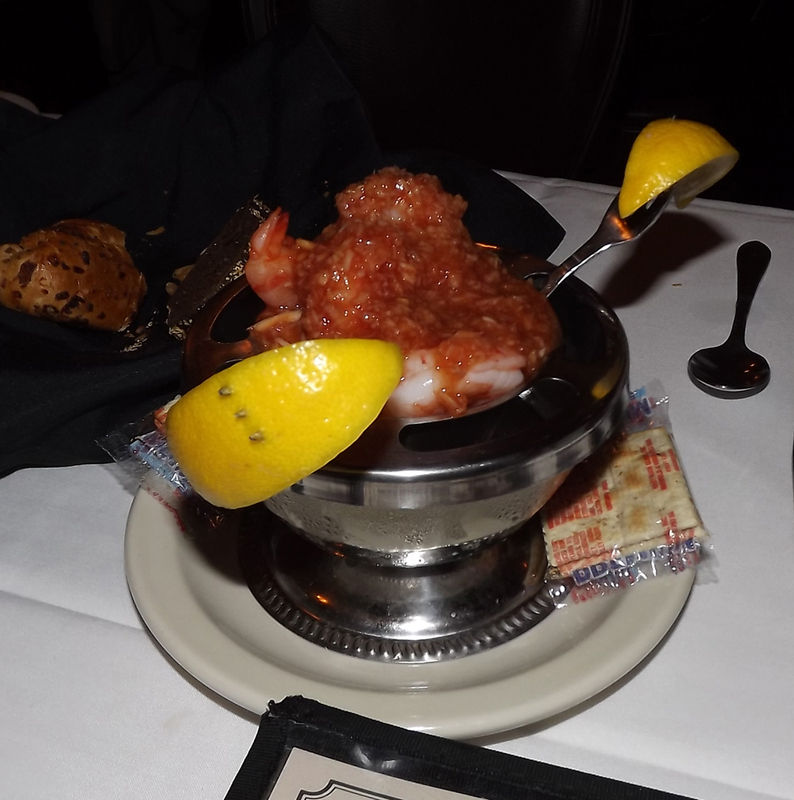 Be prepared to have your water glass handy when you eat the Spicy Shrimp Cocktail at St. Elmo’s, but you will not be disappointed. Of course, this is a steak house so you will also have no problem finding steak in any size or shape you want it, as well as seafood and chops. We finished up with a delicious Peach Blueberry Pie (a la mode, of course). 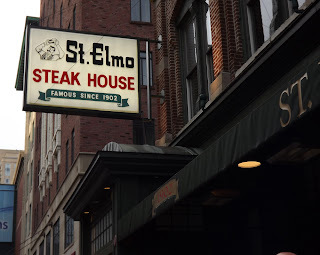 After St. Elmo’s Steakhouse, it was just Lisa and I as we headed to Tastings. 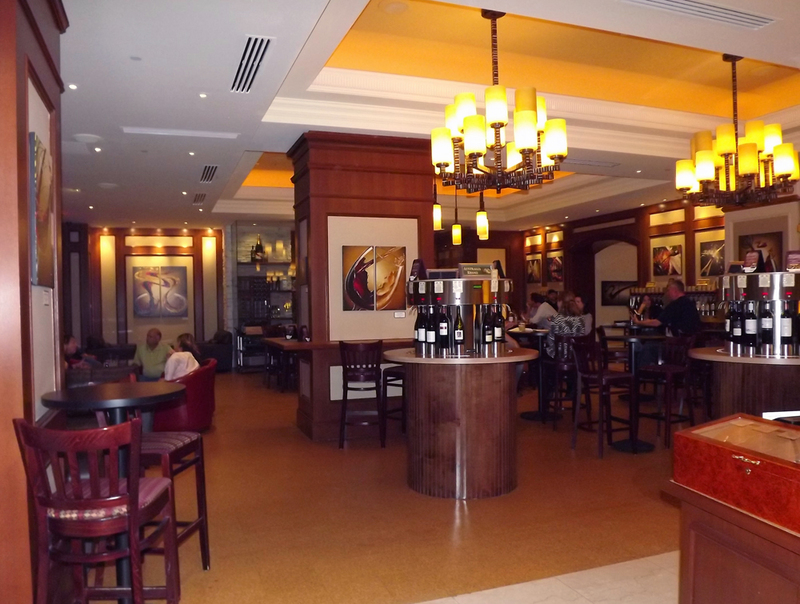 This Indianapolis wine bar is an experience worth checking out as you can choose from over 100 wines to sample. You purchase a card when you walk in and then bring it over to the wine tasting stations, where you can read about each offering and pour yourself a two, four or six ounce sample of what you’d like. The wines vary greatly in price (from about $3-$10 for the two ounce) and variety. We decided to share samples. I recommended a few to Lisa that I had previously liked, such as Stags Leap Merlot and The Chocolate Box Red, while we discovered Elk Cove Pinot Gris and Andeluna Torrontes together. We both wished it hadn’t been such a long day and vowed to make it back there before heading back to the hotel. 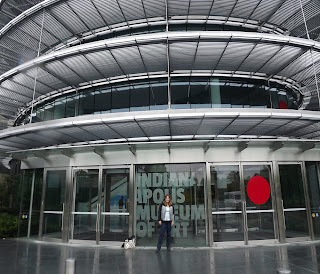 There was an even longer day coming as we checked out bit more of Indianapolis before heading to the Cedar Falls area of Ohio.